I live in Boston and inherited a condo in Miami. I was very fortunate to be referred to Matey Veissi, who has an encyclopedic knowledge of Miami real estate. In addition to doing all the usual things I would expect of a real estate agent, she cleaned out a very full unit for me, even to the point of finding an item hidden in a fake soup can in the kitchen. Her communication was excellent, sometimes contacting me multiple times a day, and best of all, she found a buyer who paid more than the asking price. All of this effort without ever even having met me! I wish I owned more Miami real estate so I could use her services again. The best service you can get in Florida! They definately will work in your best interest. Please give them a try. The best! Professional, friendly, knowledgable. I could go on forever. They are honestly the best. 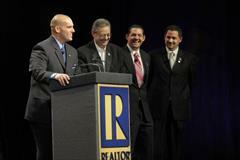 Moe is a great guy and was a fine President of the National Association of Realtors. One of the best professional offices in the Real Estate industry. Based on a real caring for their associates and customers.